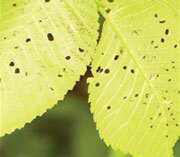 The most severe damage inflicted by the elm leaf beetle occurs mainly during the larval stages of the insect’s life cycle. The larvae skeletonise the leaves, destroying the tree’s ability to achive photosynthesis and produce reserves of energy that are necessary for growth, vigor and disease resistance. 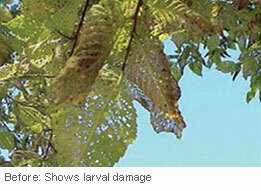 Adult beetles also damage the foliage – evidenced by a ‘shot hole’ appearance in the leaves – and this damage continues right through the growing season. Early in the season damage is often noticed on one side of the tree, and this indicates the source of hibernating and emerging beetles. Adult beetles travel quickly by flying, or they can even “hitch a ride” on a vehicle. They move from tree to tree feeding and laying eggs on the underside of leaves. Trees can often be defoliated within a very short period of time (in some cases within a week) with high temperatures increasing the speed of the beetle’s metabolism. 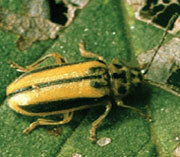 A native of Europe, the elm leaf beetle was first found in Australia in 1989, along the Mornington Peninsula. Approximately the size of a large grain of rice, the elm leaf beetle appears dull green in colour early in the season, with the colour becoming more defined as the season progresses. Elm leaf beetles hibernate over the winter period in dry sheltered places such as under tree bark and around buildings etc. Activity begins in spring as temperatures rise with beetles emerging and geeding on young elm leaves and new sucker growth. As the season advances beetles start laying small eggs in a double row, the colour and appearance of mini lemons, approximately the size of a sesame seed. 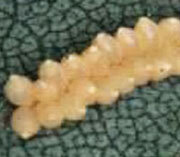 Hatching begins in 7-10 days depending on temperature, with larvae resembling small black specks. Larvae have three instars or “moults” – and grow significantly between the first and third instar. Beetle larvae feed on the leave by eating the green matter out, leaving a skeleton of veins that desiccates leaves. Also known as ‘tree vaccination’, this method involves directly injecting insecticides, fungicides or both into the actual tree trunk. 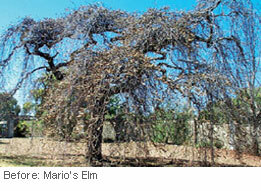 Chemistries are delivered into the sapwood or active xylelm where translocation disperses the solutes to the leaf mass. 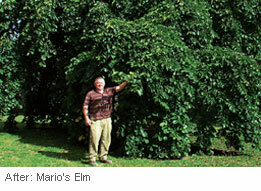 Tree injection can protect elm trees against damage and defoliation for two or more years. It is the most environmentally-friendly method known, and is safe around children, pets and riparian situations. Tree injection sites are sealed to avoid pathogen entry, and environmental contamination is negligible. 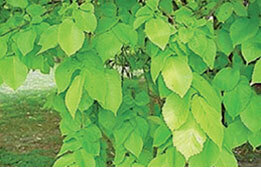 Fast, safe and inconspicuous, tree injection is an all year round procedure. 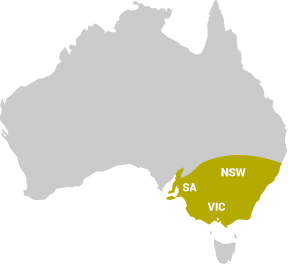 Canopy sprays and airblast treatments are implemented at full leaf expansion (around the 3rd week of October onwards and dependent on elm species and cultivar). Trees up to 30m in height can be treated with one application that will provide full protection for the entire growing season. It is important to employ appropriate treatments at the correct time to avoid major damage to, and serious decline in an untreated tree.